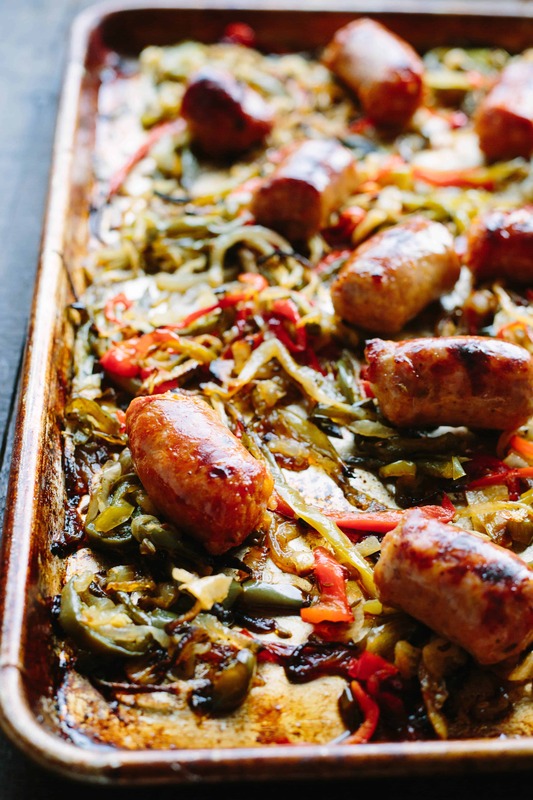 This recipe for classic Italian sausage and peppers is made easier and even better by roasting the whole thing on a sheet pan! Easy prep, easy cleanup. I’ve been into the idea of sheet pan meals ever since I met the lovely and talented Molly (of Dunk and Crumble) at a training for QVC . Molly was there to promote her new cookbook called Sheet Pan Suppers, and I was immediately intrigued. The book is brilliant. Molly is brilliant. 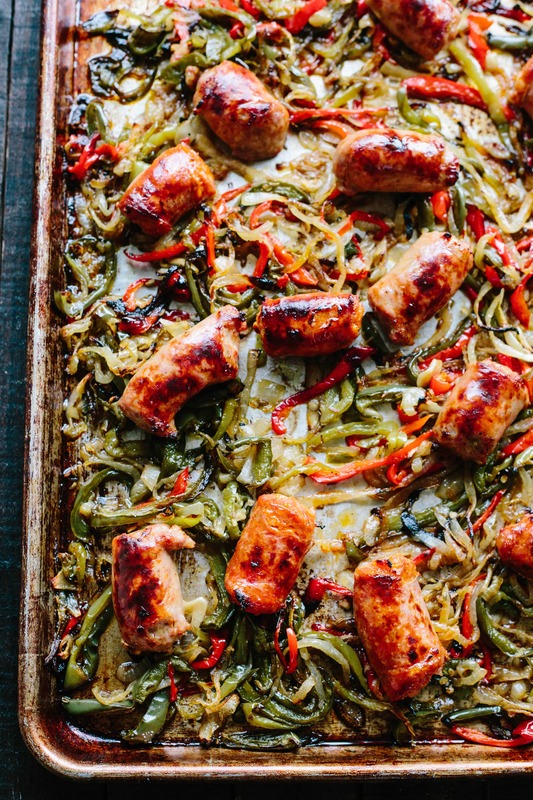 Sheet pan suppers are totally freaking brilliant. Since then, I’ve been playing around with different sheet pan meals and this one seemed like a no brainer. Sausage and peppers has been a staple in my family for as long as I can remember. Nine out of ten family gatherings will always have a big dish of it on the table. It’s definitely an Italian thing, but arguably a New Jersey thing too (they tend to go hand in hand). That said, this dish was never exactly a favorite of mine. I didn’t hate it, but it wasn’t something I ever looked forward to. For one, I never cared much for sausage, and the rest of it just seemed meh. It’s funny how your taste changes over time, and recently, I not only developed a taste for Italian sausage, I actually started to crave sausage and peppers. I didn’t have a family recipe to follow, but thought how hard could it be? So I winged it. And no offense to the family, but this version I came up with is way better (wink). Why? It all comes down to roasting. The dish I grew up eating consisted of sweet bell peppers and onions cooked down to mush in a bunch of liquid (namely, wine) and oftentimes also contained potatoes that, #sorrynotsorry, were bland and boring. The sausage then basically braised / steamed in the liquid. It could usually be found bubbling away in a crock pot with a tray of hard rolls next to it. There was never any browning happening, and that’s where my version is different. By roasting the peppers and onions at a high temperature, it allows them to get buttery soft and caramelized. 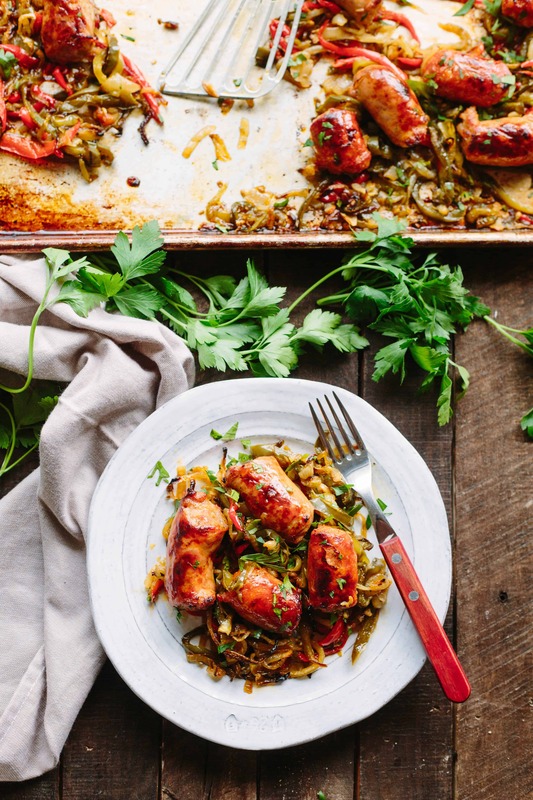 This addition of flavor and texture is a game changer, not to mention the sausage. Since it cooks a lot faster than the veggies, it gets added only for the last few minutes of cooking. Then, the broiler steps in to give it a beautifully browned and crisp exterior. We have an amazing butcher in town that makes homemade Italian sausage the old fashioned way, and it is by far my favorite. Use hot or sweet, whatever you like. The addition of both fennel seeds (which are typically found in sweet Italian sausage) and jalapeños is optional, but I think they add extra flavor and pizzaz. Yeah thats right, pizzaz. This is a great low-carb, paleo friendly meal that’s perfect for weeknight dinners or for serving a crowd. It’s great on it’s own, but personally I love it even more tucked into a crusty Italian roll (or better yet, garlic bread). It’s easy, it’s tasty, and it’s always a crowd pleaser. Be sure to give this one a try. 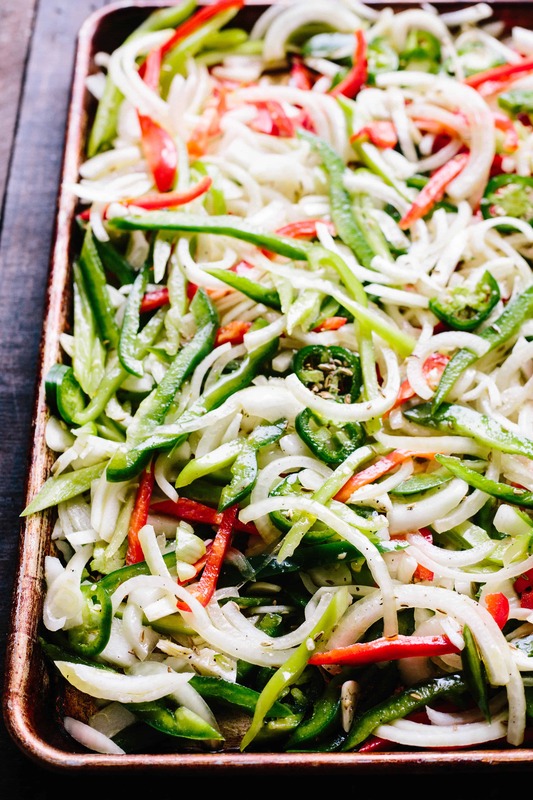 Combine bell peppers, jalapeños (if using), onion, garlic, and fennel seeds (if using) on a large sheet pan. Season generously with salt and pepper, then drizzle with olive oil and mix to combine. Roast for 20 minutes, then use a spatula to mix the vegetables around. Roast for another 20 minutes, or until very soft and caramelized around the edges (it may take a little longer). Arrange the sausage over top, then roast for another 8-10 minutes, or until cooked through. Place the pan on the top rack of the oven and switch the broiler on to high. Keep a close eye on it and remove as soon as the sausage browns. Sprinkle with parsley and serve as-is or with rolls to make sandwiches. If doubling or tripling for a crowd, be sure to use separate sheet pans for each batch. Combining too many ingredients on one pan will cause them to steam rather than caramelize. OH EMM GEE this is the most delicious picture I have seen in a a while, also a great lower-effort way to this dish. We will definitely use this for some of the upcoming holiday gatherings. PS: was sitting doing email the other day and mindlessly flipping through channels when I came across ““The Chef’s Kitchen.” on a cable (here in Florida, on youttoo, which I had never heard of before). It was like “Hey, I know that chef!”. A Coley sighting in the wild! Hey Rod! Thanks so much. It’s totally a crowd pleaser and perfect for the upcoming holidays. So cool you saw me on the Chef’s Kitchen! I know the show is in syndication in random markets all over the country, and since they change from time to time, I never know exactly where and when I’ll show up on tv. So glad you caught it! Guess what? I just made this on Sunday for hanging around & watching football. But I added fresh (thick-sliced) white mushrooms to the peppers & onions and they were a great add. Hollaaaa! (I still love that this is your handle btw.) Great idea to add the mushrooms. I’ll definitely try throwing them in next time. Perfect game day food. I’m wondering how a small bulb of fennel thinly sliced and roasted with the peppers would taste rather than the fennel seed? I think that’s a brilliant idea! I actually have half a bulb of fennel in my fridge right now and I wish I had thought to throw it in. Go for it! Added to my Pinterest board under “Keto Me, Baby!” Thanks for another great Coley recipe!! Not sure what I did wrong but this didn’t work for me. The peppers burned before they were caramelized and the sausages weren’t even close to done after 10 minutes. I ended up taking the vegetables out and cooking the sausage for another ~15 minutes. Any ideas on what went wrong? Should I lower the oven temp and cook longer? Boil the sausages first? I’m so sorry to hear this didn’t work out. I have a few thoughts: First, I’m wondering if maybe your peppers and onions were on the smaller side and therefore didn’t take up as much room on the sheet pan. That would cause them to cook a lot faster. You can see in the one picture of raw veggies that they are pretty piled up on there, and then they shrink up quite bit as they cook. I’m also curious if your oven is calibrated correctly. Keeping a separate thermometer in there is always a good move (most ovens are not calibrated correctly). My oven is convection, so that could possibly have an effect as well. Also make sure you’re cooking everything on the middle rack.. if cooked on the bottom, that could cause the veggies to cook faster and the sausage to cook slower. Also, was your sausage straight out of the refrigerator? I usually take my proteins out at least 1/2 hour before cooking so that they go into the oven at room temperature. Cooking them from cold would definitely cause them to take longer. Boiling the sausages first would certainly help speed up the process, but that defeats the purpose of a sheet pan meal! I hope this was helpful, and again, I’m sorry this didn’t work! Coley – we got two winners tonight! 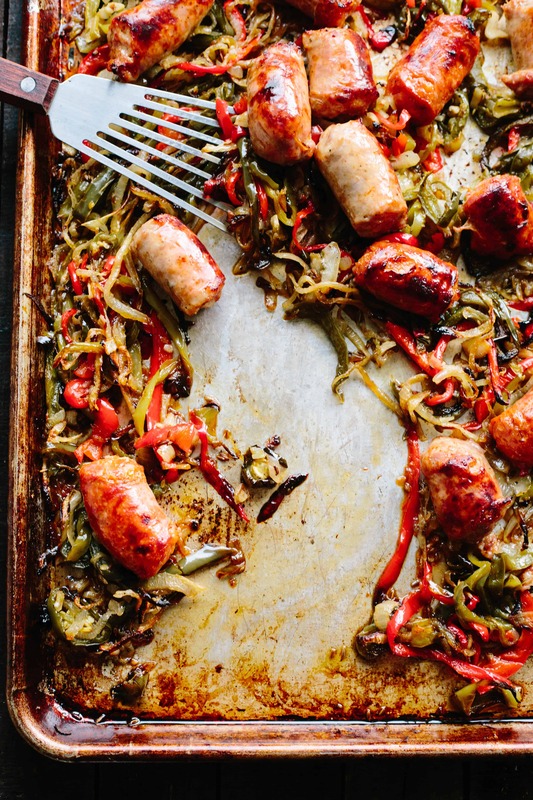 The Eagles take the Lombardi trophy and your Sheet Pan Sausage was a great half-time hit. I admit that after more than six decades of greasy wine based soggy sandwiches – this was a really pleasant surprise. Thanks for a great new way to make a South Philly/South Jersey staple. I’ll be making this one again! That’s awesome, Bruno!! So glad you loved the recipe and FLY EAGLES FLY! We watched in Spanish (in Mexico) and it was such an incredible game.